This publication appeared on a nuclear safety online discussion board. * It is a high-level review of significant commercial nuclear industry incidents and the subsequent development and implementation of related lessons learned. This post summarizes and evaluates the document then focuses on its treatment of nuclear safety culture (SC). The authors cover Three Mile Island (1979), Chernobyl (1986), Le Blayais [France] plant flooding (1999), Davis-Besse (2002), U.S. Northeast Blackout (2003) and Fukushima-Daiichi (2011). There is a summary of each incident followed by the major lessons learned, usually gleaned from official reports on the incident. Some lessons learned led to significant changes in the nuclear industry, other lessons learned were incompletely implemented or simply ignored. In the first category, the creation of INPO (Institute of Nuclear Power Operations) after TMI was a major change. ** On the other hand, lessons learned from Chernobyl were incompletely implemented, e.g., WANO (World Association of Nuclear Operators, a putative “global INPO”) was created but it has no real authority over operators. Fukushima lessons learned have focused on design, communication, accident response and regulatory deficiencies; implementation of any changes remains a work in progress. The authors echo some concerns we have raised elsewhere on this blog. For example, they note “the likelihood of a rare external event at some site at some time over the lifetime of a reactor is relatively high.” (p. 16) And “the industry should look at a much higher probability of problems than is implied in the “once in a thousand years” viewpoint.” (p. 26) Such cautions are consistent with Taleb's and Dédale's warnings that we have discussed here and here. The authors also say “Lessons can also be learned from successes.” (p. 3) We agree. That's why our recommendation that managers conduct periodic in-depth analyses of plant decisions includes decisions that had good outcomes, in addition to those with poor outcomes. The authors say “. . . a culture of safety must be adopted by all operating entities. For this to occur, the tangible benefits of a safety culture must become clear to operators.” (p. 2, repeated on p. 25) And “The nuclear power industry has from the start been aware of the need for a strong and continued emphasis on the safety culture, . . .” (p. 24) That's it for the direct mention of SC. Such treatment is inexcusably short shrift for SC. There were obvious, major SC issues at many of the plants the authors discuss. At Chernobyl, the culture permitted, among other things, testing that violated the station's own safety procedures. At Davis-Besse, the culture prioritized production over safety—a fact the authors note without acknowledging its SC significance. The combination of TEPCO's management culture which simply ignored inconvenient facts and their regulator's “see no evil” culture helped turn a significant plant event at Fukushima into an abject disaster. It's not clear who the intended audience is for this document. It was written by two professors under the aegis of the American Academy of Arts and Sciences, an organization that, among other things, “provides authoritative and nonpartisan policy advice to decision-makers in government, academia, and the private sector.”**** While it is a nice little history paper, I can't see it moving the dial in any public policy discussion. The scholarship in this article is minimal; it presents scant analysis and no new insights. Its international public policy suggestions are shallow and do not adequately recognize disparate, even oppositional, national interests. Perhaps you could give it to non-nuclear folks who express interest in the unfavorable events that have occurred in the nuclear industry. * E.D. Blandford and M.M. 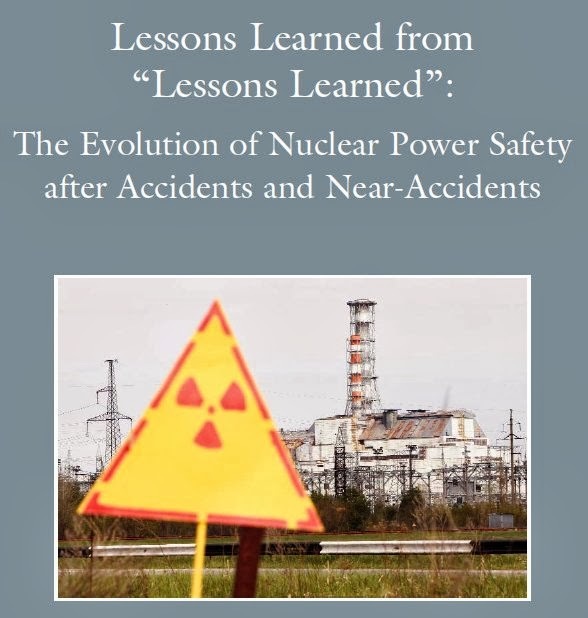 May, “Lessons Learned from “Lessons Learned”: The Evolution of Nuclear Power Safety after Accidents and Near-Accidents” (Cambridge, MA: American Academy of Arts and Sciences, 2012). Thanks to Madalina Tronea for publicizing this article on the LinkedIn Nuclear Safety group discussion board. Dr. Tronea is the group's founder/moderator. *** It is the only content that demonstrates original analysis by the authors. **** American Academy of Arts and Sciences website (retrieved Jan. 20, 2014).